Haydn’s ‘piano trios’ (as his accompanied piano sonatas are known) are among the most delightful and inventive of all his works. They have a ‘domestic’ reputation, and indeed they were intended for playing at home. But we make a mistake if we think that this meant that Haydn expected music-making of limited accomplishment. Many outstanding musicians of the eighteenth and early nineteenth centuries never performed in public for one simple reason: they were women. Who knows how many gifted women musicians were denied opportunities that their male counterparts enjoyed. But when it comes to pianists, we can at least get some idea of their talents from the music that was written for them. Among the women pianists whom Haydn met while he was in London in the 1790s, one of the most highly-regarded was Therese Jansen, a pupil of Clementi. Haydn named her as among the capital’s most important pianists. Haydn wrote for her a set of three piano trios which were published in London in 1797—Hob XV:28 and 29 on this disc, and No 27 in C major (on Hyperion CDA67719). The challenging piano parts suggests that she must have been a very fine performer—and indeed the string-writing is no less demanding. They are not only virtuoso works, but have an exceptionally wide range of expression. The Florestan Trio, with their magnificent pianist Susan Tomes, dazzle in this repertoire. Their first disc of Haydn’s piano trios was enthusiastically acclaimed (see below) and this release is sure to follow its critical and commercial success. In the late eighteenth century, as the piano became more popular in well-to-do homes, there developed a thriving market in ‘accompanied sonatas’, works for pianists to play, accompanied by their friends or servants on violin and cello. 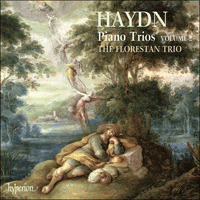 Of the many composers who supplied this demand, Haydn was by far the most distinguished, and his piano trios (as we now call them) are among the most delightful and inventive of all his works. They were intended for playing at home. But we make a mistake if we think that this meant that Haydn expected music-making of limited accomplishment. Many outstanding musicians of the eighteenth and early nineteenth centuries never performed in public for one simple reason: they were women. Those who composed might or might not have their work preserved, let alone published. Mozart’s sister Nannerl, for example, was described as a remarkable pianist and composer, but none of her work survives. Who knows how many gifted women musicians were denied opportunities that their male counterparts enjoyed. But when it comes to pianists, we can at least get some idea of their talents from the music that was written for them. Among the women pianists whom Haydn met while he was in London in the 1790s, one of the most important was Therese Jansen, a German from Aachen who was brought to settle in London by her father, a dancing master. In London she and her brother studied the piano with Clementi, and Therese became one of his best pupils. Haydn met her during his visits to London, and named her among the capital’s most important pianists. When she married Gaetano Bartolozzi, an art dealer, Haydn was a witness at their wedding. Although she did not pursue a public career, Clementi and Dussek both dedicated works to her, and Haydn wrote for her a set of three piano trios which were published in London in 1797—Hob XV:28 and 29 on this disc, and No 27 in C major (on Hyperion CDA67719). The challenging piano parts suggest that she must have been a very fine performer. The trios on this CD are Haydn’s last, but their exact order of composition is uncertain. Robbins Landon presumed that the Trio in E flat, No 29, was probably Haydn’s final word in this genre. More recently, scholars have opted for No 30 as the most likely candidate. Of the set of three trios dedicated to Therese Jansen-Bartolozzi, the Trio in E major Hob XV:28 is not only a virtuoso work, but also has an exceptionally wide range of expression. The first movement opens with an extraordinary and delicate effect: pizzicato strings with a staccato bass in the piano, while the pianist’s right hand plays a flowing melody ornamented with grace-notes. It evokes the effect of a folk-song in which the singer accompanies herself on the harp. When the pianist repeats this tune with chromatic decoration, it is as if a ‘real’ piano has answered. Energetic rushing scales break the spell, vying with more lyrical phrases until a pause is reached, and the folk-tune returns. Again this is interrupted, and the mood for the rest of the opening section is characteristically witty and good-humoured. The development discusses a selection of the elements that have already appeared, including a version of the folk-tune enlarged to sound more like a chorale. Throughout the movement Haydn makes full use of the capabilities of the English grand pianos—Mrs Bartolozzi must certainly have owned one. The Allegretto could not be a greater contrast to the first movement. In E minor, it has a continuous creeping bass-line, rather as in a baroque passacaglia. At first all three instruments state the bass together in octaves. Then the piano continues with the line in the bass, while singing an almost operatic melody above it. But this is no ordinary passacaglia: the bass winds its way, evolving and moving from key to key, until it arrives in G major. Here the stringed instruments join in, and the piano’s melody develops an obsession with a dotted-rhythm figure. This leads to a forceful reprise of the melody with which the piano solo began, but now in the bass, with the passacaglia line above. The movement ends with a series of cadenza-like flourishes. The shape of the whole movement is similar to some of J S Bach’s slow movements—such as those in the Italian Concerto and the violin concertos—but with a new dramatic dimension. The finale is also full of surprises. The opening theme has quirky phrasing which keeps on subverting the three-in-a-bar metre, and just when you expect the first strain to end after a conventional eight bars, it meanders on for an extra four. In the middle section of the movement, the violin strikes off on its own, in E minor. Then, in a passage which must have seemed outrageous to Haydn’s contemporaries, the music slips sideways into the remote key of E flat minor, before thinking better of it and returning to E minor to finish the section. The quirky opening theme returns at the end, twice interrupted by chromatic moments, as if it wishes to return to the slow movement, before two chords bring the work emphatically to a close. The last of the set for Therese Jansen-Bartolozzi, the Trio in E flat major Hob XV:29, is a work full of character and humour. The first movement is like a march, but with an almost mock-ecclesiastical air, and with its dignity punctuated by sudden accents and flourishes. A middle section moves into the minor, and becomes more serious and lyrical, allowing the violin to expand with a melody of its own. When the march returns, it is subjected to Haydn’s favourite variation techniques. The decoration becomes more and more elaborate, moving further and further from the mock-simplicity of the original. Just when the march seems to have run its course, Haydn adds a substantial coda, in which the music is pulled towards a remote and strange area, before recovering itself for a final show of self-confidence. For the slow movement, Haydn shifts down a major third to B major. The gently rocking, expansive melody gives the impression that Haydn might be settling down to quite a long movement—as Beethoven had done in his recently published Op 1 piano trios. But all of a sudden he takes a turn back by a subtle succession of modulations to the trio’s opening key of E flat, and the piano launches unexpectedly into the finale. This a triple-time ‘German Dance’. At first its mood is genial, but there are moments of truculent stamping, and suggestions of gypsy fiddles and a hurdy-gurdy. A central episode explores some of the dance’s motifs in a surprisingly serious manner. And even when the main theme returns, there are several sudden changes of direction, mood-swings, and further elaborations, before Haydn brings the dance to an end with a final twist of the hurdy-gurdy. Despite its position in Hoboken’s catalogue the Trio in E flat major Hob XV:30 is now thought likely to be the last piano trio that Haydn composed. On 9 November 1796 he wrote to the publisher Breitkopf that he was sending the promised sonata ‘at last’. In the event, it was Artaria in Vienna who published the first edition, in 1797. This work was not dedicated to a particular pianist, and the level of difficulty of the piano part is noticeably less extreme than in the trios written for known virtuosi, though still with some tricky passages, and showing Haydn’s usual high level of imagination. The opening theme is unusually expansive for Haydn, and rather reminiscent of the beginning of Mozart’s second piano quartet K493, in the same key. And, like Mozart, Haydn pours out an unusually large number of different ideas, and takes them in unexpected directions. There are two quite separate themes before we have left E flat major. And then, where a sudden chromatic shifting of keys leads us to expect the second main theme, Haydn instead returns to his first idea, and develops it further in B flat major. From there he moves gently into B flat minor, and at last we do get a new theme; though this too is derived from a phrase earlier in the movement. The development begins with a much more Haydnesque surprise, a sudden lurch into C flat major. Here the first two ideas are subjected to some informal counterpoint before the piano launches into running passages, over a chord sequence that gradually brings us closer to the home key. But instead of leading seamlessly back to E flat, as Mozart would probably have done, Haydn presents us with another harmonic surprise to get us back to the home key for the reprise. The slow movement, in three-time, has the tread and formality of a courtly dance in C major, with its two parts repeated. Then a middle section forgets the dance, becoming animated and conversational. It is the piano that calls the instruments back to the solemnity of the dance, and it recommences as if nothing had interrupted it. But almost immediately the animated running scales of the middle section break through, and the dance is once again forgotten. There is another moment when the dance is recalled, leading to a pause on a chord of G major as if we are about to return to the dance proper. But instead, Haydn launches straight back to E flat, and into the finale. This too is a dance in three-time, but fast, with a frequent off-beat ‘kick’ and an insistent character that makes it sound rather like Beethoven. A middle section takes us into a brusque E flat minor, with a yet more insistent motif. At the end of this section, Haydn returns to E flat major not by the obvious route, simply moving from minor to major, but on a detour via B major. The music could be heading almost anywhere, but suddenly we turn a corner and find ourselves back at the opening theme. With a boisterous conclusion, Haydn bids farewell to the ‘accompanied piano sonata’. Other composers continued to supply the market for this popular genre for some years to come. But by the time Haydn wrote this last example, his pupil Beethoven had published his three piano trios Op 1, and the ensemble of piano, violin and cello had been set on a dramatically new path into the nineteenth century. The Trio in E flat minor Hob XV:31 consists of only two movements, which were composed in reverse order. On a surviving autograph of this trio, the first movement is dated 1795, but the second movement is dated a year earlier. The opening Andante is in the unusual key of E flat minor, a sombre rondo with striking use of chords in the bass register of the piano—a region Haydn had come to appreciate on the sonorous English instruments he encountered in London. An episode in E flat major turns the theme upside down, decorating it into a charming fantasia. After the return of the opening, there follows a second episode which transports us surprisingly to the key of B major. Here the violin breaks loose from the piano and soars off into a Schubertian melody (it is partly the change of key, down a major third, which makes it sound Schubertian). Then, in a final reprise, violin and piano join forces again in a rather agitated version of the rondo theme, elaborated in a triplet rhythm. After the liberation of the first movement, the violin never looks back. But the reason is partly to be found in the origin of the second movement, which Haydn wrote first. This jaunty Allegro in E flat major has in the autograph a heading which Haydn later scratched out: ‘Sonata Jacob’s Dream by Dr Haydn’. This refers to a story in the Book of Genesis, in which Jacob sleeps: ‘And he dreamed, and behold a ladder set up on the earth, and the top of it reached to heaven: and behold the angels of God ascending and descending on it.’ Perhaps Haydn deleted the title because he feared that it might be thought inappropriate to give a religious reference to what was, in origin, a practical joke. Albert Christoph Dies, who interviewed the composer several times in his old age and published Biographical Accounts of Joseph Haydn in 1810, tells us that in London Haydn got to know a German violinist ‘who had acquired the technique almost of a virtuoso; but had the terrible habit of spending a lot of time stumbling about in the highest register. Haydn decided to make an attempt to put the amateur off his atrocious habit’. According to Dies, Haydn sent ‘Jacob’s Dream’ anonymously to Therese Jansen, who tried it out with the German violinist, with hilarious consequences. Haydn had peppered the movement with virtuoso violin writing, echoing the virtuosity of the piano part, and ending with passages that are both high and impossibly fast. The two movements of the Trio were unpublished for several years, but eventually appeared in print in Vienna in 1803, with a dedication to Magdalena von Kurzböck, an admired Viennese pianist and composer. À la fin du XVIIIe siècle, le piano se popularisa dans les riches demeures et un marché florissant se développa, celui des «sonates accompagnées», œuvres que les pianistes jouaient accompagnés d’amis ou de serviteurs au violon et au violoncelle. Le plus éminent des compositeurs ayant répondu à cette demande fut, et de loin, Haydn—ses trios avec piano (comme nous les appelons aujourd’hui) comptent parmi ses pages les plus charmantes, les plus inventives. Elles étaient destinées à être jouées en privé, mais ne croyons pas pour autant que Haydn escomptait une exécution de moindre qualité. Quantité de musiciens remarquables du XVIIIe siècle et du début du XIXe ne jouèrent jamais en public et ce pour une seule et simple raison: c’étaient des femmes. Celles qui composaient ne pouvaient pas toujours voir leur travail sauvegardé, encore moins publié. Nannerl, la sœur de Mozart, était ainsi décrite comme une remarquable pianiste-compositrice et pourtant, aucune de ses œuvres ne nous est parvenue. Qui sait combien de musiciennes douées se virent refuser les opportunités offertes à leurs homologues masculins? Concernant les pianistes, nous pouvons au moins nous faire une idée de leur talent grâce à la musique qui fut écrite pour elles. L’une des plus importantes pianistes que Haydn rencontra lors de ses séjours londoniens des années 1790 fut Therese Jansen, une Allemande d’Aix-la-Chapelle venue en Angleterre dans le sillage de son père, maître de danse. Installés à Londres, son frère et elle étudièrent le piano avec Clementi, dont elle devint l’une des meilleures élèves. Haydn la mentionna comme l’une des pianistes majeures de la capitale. Il fut témoin à son mariage avec le marchand d’art Gaetano Bartolozzi. Elle ne poursuivit pas de carrière publique mais Clementi et Dussek lui dédièrent des œuvres et Haydn lui écrivit une série de trois trios avec piano publiés à Londres en 1797—Hob XV:28 et 29, qui figurent sur ce disque, et le no 27 en ut majeur (sur le disque Hyperion CDA67719). Leurs redoutables parties de piano laissent deviner quelle excellente interprète elle devait être. Les trios de ce CD sont les derniers de Haydn, mais l’exacte chronologie de leur composition est incertaine. Pour Robbins Landon, le Trio en mi bémol no 29 fut probablement l’ultime mais, depuis peu, les spécialistes penchent pour le no 30. Issu du corpus de trois trios dédié à Therese Jansen-Bartolozzi, le Trio en mi majeur Hob XV:28 est une œuvre virtuose à la palette expressive exceptionnellement large. Le premier mouvement s’ouvre sur un effet extraordinaire et subtil: des cordes en pizzicato avec une basse staccato au piano, la main droite du pianiste exécutant une mélodie coulante ornée de petites notes. On a l’impression d’un chant populaire dans lequel la chanteuse s’accompagnerait à la harpe. Quand le pianiste reprend cet air avec une décoration chromatique, c’est comme si un «vrai» piano répondait. D’énergiques gammes impétueuses rompent le charme et rivalisent avec des phrases davantage lyriques jusqu’à une pause; puis le chant populaire revient pour être de nouveau interrompu et le reste de la section initiale est, on ne s’en étonnera pas, toute verve et bonhomie. Le développement traite une sélection d’éléments antérieurs, dont une version de l’air populaire étoffé pour mieux lui donner des allures de choral. Tout au long de ce mouvement, Haydn exploite à fond les capacités des pianos à queue anglais—Mrs Bartolozzi en possédait sûrement un. L’Allegretto est l’antithèse du premier mouvement. En mi mineur, il a une ligne de basse lente et continue, un peu comme dans une passacaille baroque. Les trois instruments commencent par énoncer la basse ensemble, en octaves, puis le piano poursuit avec la ligne à la basse, tout en chantant par-dessus une mélodie quasi opératique. Mais ce n’est pas une passacaille ordinaire: la basse chemine, évolue, passe de ton en ton jusqu’à sol majeur. Là, les instruments à cordes la rejoignent et la mélodie pianistique devient obsédée par une figure en rythme pointé. S’ensuit une vigoureuse reprise de la mélodie inaugurale du solo pianistique mais cette fois à la basse, avec la ligne de passacaille au-dessus. L’ensemble de ce mouvement, qui s’achève sur une série de fioritures façon cadenza, est, dans sa forme, similaire à certains mouvements lents de J. S. Bach—tels ceux du Concerto italien et des concertos pour violon—, mais avec une nouvelle dimension dramatique. Le finale regorge, lui aussi, de surprises. Le thème liminaire présente un phrasé bizarre qui ne cesse de subvertir le mètre ternaire et, alors même qu’on le pense terminé au bout des huit mesures conventionnelles, le premier volet continue de sinuer pendant quatre mesures. Dans la section centrale, le violon entre seul, en mi mineur. Puis, dans un passage qui a dû choquer à l’époque, la musique glisse de côté dans la tonalité éloignée de mi bémol mineur, avant de se raviser et de finir la section en mi mineur. L’étrange thème liminaire revient à la fin, mais est deux fois interrompu par des moments chromatiques, comme s’il voulait repartir vers le mouvement lent, avant que deux accords ne closent définitivement l’œuvre. Dernière pièce du corpus dédié à Therese Jansen-Bartolozzi, le Trio en mi bémol majeur Hob XV:29 déborde de caractère et d’humour. Son premier mouvement tient de la marche, mais une marche presque pseudo-ecclésiastique, à la dignité ponctuée de brusques accents et de fioritures. Une section centrale vire au mineur et se fait plus sérieuse, plus lyrique, permettant au violon de développer une mélodie propre soumise, lorsque la marche revient, aux techniques de variation chères à Haydn. L’ornementation se complique, s’éloigne toujours plus de la simplicité feinte de l’original. Au moment même où la marche semble avoir terminé sa course, Haydn ajoute une coda substantielle, où la musique est poussée vers une région éloignée et étrange avant de se ressaisir pour une ultime démonstration d’assurance. Pour le mouvement lent, Haydn descend d’une tierce majeure, à si majeur. La mélodie expansive, doucement berçante, donne l’impression qu’il s’embarque pour un très long mouvement—comme Beethoven l’avait fait dans ses trios avec piano op. 1, alors fraîchement publiés. Mais, tout à trac, Haydn tourne casaque avec une subtile succession de modulations du ton initial du trio (mi bémol), et le piano se lance inopinément dans le finale. C’est une «Danse allemande» ternaire, au climat d’abord affable, malgré des moments de tapement truculents, mais aussi des évocations de violons tziganes et de vielles à roue. Un épisode central explore certains motifs de la danse avec un sérieux étonnant. Et même au retour du thème principal, les changements de direction, balancements de climat et autres complications abondent avant que Haydn n’achève la danse sur un dernier tour de vielle. Nonobstant sa position dans le catalogue de Hoboken, le Trio en mi bémol majeur Hob XV:30 est aujourd’hui considéré comme l’ultime trio avec piano haydnien. Le 9 novembre 1796, le compositeur écrivit à l’éditeur Breitkopf qu’il lui expédiait «enfin» la sonate promise. En définitive, ce fut l’éditeur viennois Artaria qui en assura la première édition, en 1797. Dédiée à aucun pianiste en particulier, cette œuvre a une partie de piano bien moins difficile que dans les trios écrits pour des virtuoses féminines—ce qui n’exclut ni quelques passages épineux, ni l’habituelle imagination élevée de Haydn. Le thème d’ouverture, exceptionnellement expansif pour Haydn, rappelle assez le début du quatuor avec piano no 2 K493 de Mozart, dans la même tonalité. Comme Mozart, Haydn déverse un flot extraordinairement important d’idées et leur fait prendre des directions inattendues. Avant même qu’on ait quitté mi bémol majeur, il y a deux thèmes complètement distincts puis, alors qu’un brusque changement de tonalité chromatique fait qu’on s’attend au second thème principal, Haydn revient à sa première idée pour la développer plus avant en si bémol majeur. De là, il passe doucement en si bémol mineur et un nouveau thème arrive enfin, encore qu’il soit, lui aussi, dérivé d’une phrase énoncée plus tôt dans le mouvement. Le développement s’amorce par une surprise bien plus haydnesque: une brusque embardée en ut bémol majeur. Là, les deux premières idées sont soumises à un contrepoint informel, puis le piano entame des passages rapides par-dessus une séquence d’accords qui nous rapproche peu à peu du ton principal. Mais au lieu de revenir à un cohérent mi bémol, comme Mozart l’eût probablement fait, Haydn nous gratifie d’une nouvelle surprise harmonique et nous ramène au ton principal pour la reprise. Le mouvement lent, ternaire, a le pas et la gravité d’une danse courtoise en ut majeur, avec ses deux parties répétées. Puis cette danse est oubliée pour que la section médiane se fasse animée, conversante, et c’est au piano de rappeler les instruments à sa solennité—elle reprend alors comme si rien ne l’avait interrompue. Mais, presque immédiatement, les véloces gammes animées de la section médiane font irruption et elle est de nouveau délaissée avant d’être rappelée derechef, une pause sur un accord de sol majeur survenant ensuite, comme si on allait vraiment y revenir. Mais au lieu de cela, Haydn file tout droit retrouver mi bémol et se lance dans le finale. C’est encore une danse ternaire, mais rapide, avec un fréquent «coup» anacroustique et une obstination qui la fait ressembler à du Beethoven. Une section centrale nous entraîne en un brusque mi bémol mineur, avec un motif plus insistant encore. À la fin de cette section, Haydn revient à mi bémol majeur non en se contentant de passer de mineur à majeur mais en opérant un détour via si majeur. La musique pourrait aller dans n’importe quelle direction mais, soudain, on prend un tournant et on se retrouve au thème d’ouverture. Dans une conclusion tumultueuse, Haydn fait ses adieux à la «sonate pour piano accompagnée», un genre populaire que d’autres compositeurs alimentèrent encore durant quelques années. Mais, alors que Haydn composait cet ultime exemplaire, son élève Beethoven avait publié ses trois trios avec piano op. 1 et l’ensemble piano/violon/violoncelle était déjà lancé sur une voie radicalement nouvelle, menant tout droit au XIXe siècle. Le Trio en mi bémol mineur Hob XV:31 compte seulement deux mouvements, qui furent composés en ordre inverse—un autographe nous apprend que le premier mouvement aurait été écrit en 1795, un an après le second mouvement. L’Andante initial est dans le ton inhabituel de mi bémol mineur, un sombre rondo faisant un saisissant usage des accords dans le registre grave du piano—une zone que Haydn avait pu apprécier sur les sonores instruments anglais qu’il avait découverts à Londres. Un épisode en mi bémol majeur chamboule le thème en l’ornant d’une charmante fantaisie. Le retour du début est suivi d’un second épisode qui nous transporte étonnamment en si majeur. Là, le violon lâche le piano pour s’élever dans une mélodie schubertienne (c’est en partie le changement de tonalité, une tierce majeure plus bas, qui lui donne cette sonorité schubertienne). Puis, dans une dernière reprise, violon et piano unissent de nouveau leurs forces dans une version assez agitée du thème de rondo, développé en un rythme de triolets. Une fois le premer mouvement libéré, le violon ne se retourne jamais. Ce qui tient surtout à l’origine du second mouvement, rédigé en premier. Cet enjoué Allegro en mi bémol majeur a, sur l’autographe, en en-tête que le compositeur a ensuite biffé: «Sonate Le Songe de Jacob par le Dr Haydn», en référence à un épisode de la Genèse dans lequel Jacob dort («Il eut un songe. Et voici, une échelle était dressée sur la terre et son sommet touchait au ciel. Et voici, les anges de Dieu y montaient et descendaient»). Haydn supprima peut-être ce titre par crainte que l’on jugeât inopportun d’associer une référence religieuse à ce qui était, au départ, une farce. Albert Christoph Dies, qui interrogea à plusieurs reprises le vieil Haydn et publia, en 1810, des Compte-rendus biographiques de Joseph Haydn, nous apprend que le compositeur fit, à Londres, la connaissance d’un violoniste allemand «qui s’était acquis une technique proche de celle d’un virtuose, mais qui avait la détestable habitude de monter toujours trop haut dans les aigus, tout près du chevalet. Haydn se jura d’essayer de voir s’il ne serait pas possible de dégoûter cet amateur de son travers». Selon Dies, il envoya anonymement le «Songe de Jacob» à Therese Jansen, qui l’essaya avec le violoniste allemand. Le résultat fut hilarant. Haydn avait truffé le mouvement d’écriture violonistique virtuose, en écho à la virtuosité de la partie pianistique, pour terminer sur des passages aigus incroyablement rapides. Les deux mouvements du Trio demeurèrent inédits jusqu’en 1803, année de leur publication à Vienne, avec une dédicace à Magdalena von Kurzböck, pianiste-compositrice viennoise admirée. Mit der zunehmenden Beliebtheit des Klaviers im späten 18. Jahrhundert in den höheren Gesellschaftsschichten entwickelte sich ein großes Interesse an „begleiteten Sonaten“; Werke also für Pianisten, in denen sie von ihren Freunden oder Dienern auf der Geige und dem Cello begleitet wurden. Von den zahlreichen Komponisten, die diesen Markt bedienten, war Haydn bei weitem der bedeutendste und seine Klaviertrios (wie sie heute genannt werden) gehören zu seinen reizvollsten und einfallsreichsten Werken überhaupt. Sie waren als Hausmusik konzipiert. Doch es wäre falsch davon auszugehen, dass Haydn den Ausführenden deshalb mindere musikalische Fähigkeiten zugestand. Viele hervorragende Musiker des 18. und frühen 19. Jahrhunderts gaben keine öffentlichen Konzerte—aus dem einfachen Grunde, dass sie Frauen waren. Die Werke von Komponistinnen wurden nicht unbedingt aufbewahrt, geschweige denn veröffentlicht. Mozarts Schwester Nannerl zum Beispiel wurde als bemerkenswerte Pianistin und Komponistin beschrieben, doch sind von ihr keine Werke überliefert. Wer weiß, wie vielen begabten Musikerinnen die Gelegenheiten verweigert wurden, die ihren männlichen Kollegen offenstanden. Was jedoch Pianistinnen anbetrifft, so kann man sich jedenfalls anhand der Werke, die für die geschrieben wurden, eine Vorstellung von ihrer Begabung machen. Eine der wichtigsten Pianistinnen, die Haydn während seiner Aufenthalte in London in den 1790er Jahren kennenlernte, war Therese Jansen, eine Deutsche aus Aachen, die von ihrem Vater, einem Tanzmeister, nach London gebracht worden war, um sich dort anzusiedeln. In London studierten sie und ihr Bruder Klavier bei Clementi und Therese wurde eine seiner besten Schülerinnen. Als Haydn sie in London kennenlernte, erklärte er sie zu einer der wichtigsten Pianistinnen der englischen Hauptstadt. Bei ihrer Hochzeit mit dem Kunsthändler Gaetano Bartolozzi war Haydn Trauzeuge. Obwohl sie keine öffentliche Karriere machte, widmeten ihr sowohl Clementi als auch Dussek verschiedene Werke und Haydn komponierte einen Zyklus von drei Klaviertrios, die 1797 in London herausgegeben wurden, für sie: Hob. XV:28 und 29, die auf der vorliegenden CD zu hören sind, sowie Nr. 27 in C-Dur (siehe Hyperion CDA67719). Die anspruchsvollen Klavierstimmen legen nahe, dass sie eine hervorragende Pianistin gewesen sein muss. Die Trios auf der vorliegenden CDs sind die letzten, die Haydn komponierte, doch ist die genaue Abfolge ihrer Entstehung ungewiss. Robbins Landon nahm an, dass das Trio in Es-Dur, Nr. 29, wahrscheinlich Haydns letztes Werk dieses Genres war. Neuere Forschungen haben jedoch ergeben, dass Nr. 30 der wahrscheinlichere Kandidat dafür ist. In dem Zyklus der drei Trios, die Therese Jansen-Bartolozzi gewidmet sind, ist das Trio in E-Dur Hob. XV:28 nicht nur ein virtuoses Werk, sondern auch eines mit einer besonders weitgespannten Ausdruckspalette. Der erste Satz beginnt mit einem außergewöhnlichen und anmutigen Effekt: Pizzicato-Streicher mit einem Staccato-Bass in der Klavierstimme, während in die rechte Hand des Pianisten eine fließende Melodie spielt, die mit Vorschlagsnoten verziert ist. Hier wird der Eindruck eines Volksliedes erzeugt, bei dem die Sängerin sich selbst auf der Harfe begleitet. Wenn in der Klavierstimme die Melodie wiederholt und mit chromatischen Ornamenten verziert wird, scheint es, als habe das „richtige“ Klavier geantwortet. Energische, schnelle Tonleitern lösen den Bann und wetteifern mit weiteren lyrischen Phrasen bis eine Pause erreicht wird und das Volkslied wiederkehrt. Dieses wird wiederum unterbrochen und im Rest des Anfangsteils zeichnet sich die Stimmung durch den für Haydn charakteristischen Witz und seine gute Laune aus. In der Durchführung werden verschiedene Elemente behandelt, die bereits vorgekommen sind, darunter eine Version des Volksliedes, die hier erweitert ist und eher choralartig klingt. Während des gesamten Satzes nutzt Haydn die Möglichkeiten der englischen Flügel voll aus—Frau Bartolozzi muss sicherlich einen zur Verfügung gehabt haben. Das Allegretto könnte vom ersten Satz kaum unterschiedlicher sein. Es steht in e-Moll und es zieht sich eine fortlaufend kriechende Basslinie, ähnlich wie in einer barocken Passacaglia, durch den gesamten Satz. Zunächst erklingt in allen drei Instrumenten die Bassstimme in Oktaven. Dann führt das Klavier dies in der linken Hand fort, während darüber eine fast opernhafte Melodie „gesungen“ wird. Doch ist dies keine gewöhnliche Passacaglia: der Bass windet sich voran, sich weiterentwickelnd und von Tonart zu Tonart bewegend, bis er in G-Dur ankommt. Hier gesellen sich die Streichinstrumente hinzu und in der Melodie des Klaviers entwickelt sich eine obsessive punktierte Figur. Dies führt zu einer resoluten Reprise der Melodie, mit der das Klaviersolo begann, nur dass sie jetzt in den Bass verlegt ist und die Passacaglia darüber erklingt. Der Satz endet mit einer Reihe von kadenzartigen Figuren. Die Form des Satzes insgesamt erinnert an gewisse langsame Sätze von J. S. Bach—wie etwa im Italienischen Konzert oder in den Violinkonzerten—jedoch mit einer neuen dramatischen Dimension. Das Finale ist ebenfalls voller Überraschungen. Das Anfangsthema ist ungewöhnlich phrasiert, was bewirkt, dass der Dreierrhythmus immer wieder unterlaufen wird und wenn man nach einer konventionellen Phase von acht Takten das Ende des ersten Themas erwartet, streckt es sich noch über vier weitere Takte hin. Im Mittelteil des Satzes macht sich die Geige für eine Zeitlang in e-Moll selbstständig. Und dann, in einer Passage, die für Haydns Zeitgenossen unerhört gewirkt haben muss, rutscht die Musik in das entfernte es-Moll, bevor sie sich eines Besseren besinnt und im Schlussteil nach e-Moll zurückkehrt. Das ungewöhnliche Anfangsthema kehrt gegen Ende wieder und wird zweimal von chromatischen Figuren unterbrochen, als ob die Musik zum langsamen Satz zurückkehren wollte, bevor zwei Akkorde das Werk zu einem emphatischen Schluss bringen. Das letzte Werk aus dem Zyklus für Therese Jansen-Bartolozzi, das Trio in Es-Dur Hob. XV:29, ist ein besonders charaktervolles und humorvolles Stück. Der erste Satz ähnelt einem Marsch, der jedoch eine pseudo-kirchliche Atmosphäre hat, deren Erhabenheit von plötzlichen Akzenten und Schnörkeln durchsetzt ist. In einem Mittelteil bewegt sich die Musik nach Moll, wird ernster und lyrischer und gibt der Geige Gelegenheit, ihre eigene Melodie darzustellen. Wenn der Marsch wiederkehrt, wird er mit Haydns bevorzugter Variationstechnik behandelt. Die Verzierungen werden immer aufwendiger und bewegen sich von der scheinbaren Schlichtheit des Originals immer weiter weg. Just, wenn der Marsch am Ende zu sein scheint, fügt Haydn eine umfangreiche Coda an, in der die Musik in weit entfernte und seltsame Gefilde gezerrt wird, bevor sie sich wieder erholt und ein letztes Mal ihr Selbstbewusstsein beweist. Im langsamen Satz bewegt sich Haydn eine große Terz nach H-Dur hinunter. Die sanft hin- und herwiegende, weitgespannte Melodie erweckt den Eindruck, als ob Haydn hier auf einen langen Satz vorbereitet—ebenso wie Beethoven es in seinen Klaviertrios op. 1 getan hatte, die nur wenig früher herausgegeben worden waren. Doch plötzlich wendet er sich mit Hilfe einer kunstvollen Reihe von Modulationen zur Anfangstonart Es-Dur zurück und das Klavier beginnt unvermutet das Finale. Es ist dies ein „Tanz im deutschen Stil“ im Dreiertakt. Zunächst ist die Stimmung herzlich, doch macht sich dann ein etwas grobes Stampfen bemerkbar, sowie Andeutungen an Zigeuner-Fideln und eine Drehleier. In einer zentralen Episode werden einige der Tanzmotive in überraschend ernster Weise beleuchtet. Und selbst wenn das Hauptthema zurückkehrt, finden immer noch mehrere plötzliche Richtungswechsel, Stimmungsschwankungen und weitere Ausführungen statt, bevor Haydn den Tanz mit Hilfe einer überraschenden Wendung der Drehleier zu Ende bringt. Trotz seiner Position im Hoboken Verzeichnis gehen die Forscher heutzutage davon aus, dass das Trio in Es-Dur Hob. XV:30 wohl das letzte Klaviertrio ist, das Haydn komponierte. Am 9. November 1796 schrieb er an den Verleger Breitkopf, dass er „endlich die versprochene Clavier Sonate“ übersenden könne. Doch wurde das Werk letztendlich 1797 von Artaria in Wien herausgegeben. Es ist keinem speziellen Pianisten gewidmet und der Schwierigkeitsgrad der Klavierstimme ist deutlich niedriger als in den Trios, die für die Klaviervirtuosin entstanden. Trotzdem sind in dem Werk einige heikle Passagen enthalten und Haydns großer Einfallsreichtum ist deutlich erkennbar. Das Anfangsthema ist für Haydn ungewöhnlich weitläufig und erinnert an den Beginn von Mozarts zweitem Klavierquartett, KV 493, das in derselben Tonart steht. Ebenso wie Mozart formt auch Haydn besonders viele Motive und entwickelt diese auf ungewöhnliche Art weiter. Bevor wir Es-Dur verlassen, haben sich zwei recht unterschiedliche Themen herausgebildet. Und dann, wenn ein plötzlicher chromatischer Tonartenwechsel das zweite Hauptthema einzuführen scheint, kehrt Haydn stattdessen zu seinem ersten Motiv zurück und entwickelt es in B-Dur weiter. Von da aus führt er es behutsam nach b-Moll und letztendlich erscheint doch noch ein neues Thema, obwohl dieses auch aus einer Phrase heraus entstanden ist, die zuvor im Satz zu hören war. Die Durchführung beginnt mit einer sehr viel typischeren Überraschung, nämlich mit einem plötzlichen Ruck nach Ces-Dur. Hier werden die ersten beiden Motive mit einem informellen Kontrapunkt verarbeitet, bevor in der Klavierstimme laufende Passagen über einer Akkordfolge erklingen, die schrittweise zur Grundtonart zurückführt. Haydn konstruiert jedoch keinen nahtlosen Übergang nach Es-Dur, wie Mozart es wahrscheinlich getan hätte, sondern präsentiert wiederum eine harmonische Überraschung, mit deren Hilfe er dann zur Grundtonart zurück- und zur Reprise hinführt. Der langsame Satz steht in einem Dreierrhythmus und hat das Profil und die Förmlichkeit eines höfischen Tanzes in C-Dur, dessen zwei Teile jeweils wiederholt werden. Dann erscheint jedoch ein Mittelteil, in dem der Tanz vergessen und der Ton angeregter und aufgeschlossener wird. Das Klavier schließlich holt die Streichinstrumente in die ernsthafte Atmosphäre des Tanzes zurück, der wieder von vorn losgeht als sei nichts geschehen. Doch fast unmittelbar danach kehren die lebhaften, laufenden Tonleitern zurück und der Tanz wird ein zweites Mal vergessen. Es kommt noch ein weiterer Moment, wenn der Tanz nochmals beginnt, was dann zu einer Pause nach einem G-Dur-Akkord führt, wonach man eigentlich eine richtige Rückkehr zum Tanz erwarten würde. Doch stattdessen geht Haydn direkt nach Es-Dur zurück und leitet ins Finale hinein. Auch dieses ist ein Tanz im Dreiertakt, jedoch ein schneller mit häufigen „Tritten“ gegen den Takt und einem beharrlichen Charakter, der deutlich Beethovensche Züge trägt. Ein Mittelteil führt zu einem brüsken es-Moll mit einem noch beharrlicheren Motiv. Am Ende dieses Teils kehrt Haydn nach Es-Dur zurück, jedoch nicht auf dem zu erwartendem Wege—sich also einfach von Moll nach Dur bewegend—sondern über einen Abstecher nach H-Dur. Die Musik könnte sich in alle möglichen Richtungen wenden, doch biegt sie plötzlich um eine Ecke und befindet sich wieder beim Anfangsthema. Mit einem ungestümen Schluss verabschiedet sich Haydn von der „begleiteten Klaviersonate“. Andere Komponisten nutzten die Marktlage dieses beliebten Genres noch mehrere Jahre. Doch als Haydn sein letztes Werk dieser Art schrieb, hatte sein Schüler Beethoven gerade seine drei Klaviertrios op. 1 veröffentlicht und die Kombination von Klavier, Violine und Violoncello begab sich damit auf einen völlig neuen Weg, der ins 19. Jahrhundert führte. Das Trio in es-Moll Hob. XV:31 besteht aus nur zwei Sätzen, die in umgekehrter Reihenfolge komponiert wurden. In einem überlieferten Manuskript ist der erste Satz auf 1795 datiert, der zweite Satz jedoch auf das Jahr davor. Der erste Satz, ein Andante, steht in der ungewöhnlichen Tonart es-Moll und ist ein düsteres Rondo, in dem ergreifende Akkorde im Bassregister des Klaviers erklingen—eine Region des Instruments, die Haydn dank der klangvollen englischen Instrumente, die ihm in London begegnet waren, zu schätzen gelernt hatte. In einem Couplet in Es-Dur wird das Thema auf den Kopf gestellt, verziert und in eine reizvolle Fantasie verwandelt. Nachdem das Anfangsmaterial noch einmal wiederholt wird, folgt ein zweites Couplet, das überraschend nach H-Dur führt. Hier reißt sich die Geige von der Klavierstimme los und hebt mit einer Schubertschen Melodie ab (es ist unter anderem der Tonartenwechsel, nämlich eine große Terz herab, der die Assoziation an Schubert weckt). Schließlich finden in der letzten Reprise Violine und Klavier wieder zueinander und spielen eine recht angeregte Version des Rondo-Themas, das hier mit einem Triolenrhythmus verziert ist. Nach dem freien Flug im ersten Satz blickt die Violine nicht mehr zurück. Doch hängt dies sicherlich auch mit dem Ursprung des zweiten Satzes zusammen, den Haydn zuerst komponierte. Dieses flotte Allegro in Es-Dur trägt im autographen Manuskript eine Überschrift, die Haydn später ausradierte: „Sonata Jacob’s Dream by Dr Haydn“. Dies bezieht sich auf die Textstelle im ersten Buch Mose, in der Jakob schläft: „Und ihm träumte, und siehe, eine Leiter stand auf Erden, die rührte mit der Spitze an den Himmel, und siehe, die Engel Gottes stiegen daran auf und nieder.“ Möglicherweise tilgte Haydn den Titel, um nicht blasphemisch zu wirken—die Überschrift spielte nämlich auf einen Streich seinerseits an. Albert Christoph Dies, der den betagten Komponisten mehrmals interviewte und 1810 ein Buch mit dem Titel Biographische Nachrichten von Joseph Haydn herausgab, berichtet: „Er [Haydn] stand in London in genauer Bekanntschaft mit einem deutschen Musikliebhaber, der sich auf der Geige eine an Virtuosität grenzende Fertigkeit erworben, aber die üble Gewohnheit hatte, sich immer in den höchsten Tönen, in der Nähe des Steges, zu versteigen. Haydn nahm sich vor, einen Versuch zu machen, ob es nicht möglich wäre, dem Dilettanten seine Gewohnheit zu verleiden.“ Dies zufolge sandte Haydn „Jakobs Traum“ anonym Therese Jansen zu, die das Werk zusammen mit jenem deutschen Geiger probierte—mit köstlichen Konsequenzen. Haydn hatte den Satz mit virtuosen Passagen für die Violinstimme gespickt, die eine Art Echo der virtuosen Klavierpassagen sind und der Satz endet mit besonders hohen und fast unspielbar schnellen Passagen. Die beiden Sätze blieben mehrere Jahre lang unveröffentlicht, erschienen schließlich jedoch 1803 in Wien und trugen eine Widmung an die angesehene Wiener Pianistin und Komponistin Magdalena von Kurzböck.